Routing performance for the 692GR using our standard test method is summarized in Table 1 and Figure 5 shows the composite IxChariot plot for the three routing speed tests. Throughput is pretty steady for both unidirectional and simultaneous tests. Note also that in the simultaneous test, both up and downlink throughput is the same. The Maximum Simultaneous Session test topped out at 14,976, which is close enough to the 14,983 sessions measured for the TEW-691GR to be considered the same. The 692GR is not Wi-Fi Certified, but it properly defaulted to 20 MHz bandwidth mode on the 2.4 GHz radio on power-up, as it also did for the 5 GHz band. I was able to run a Wi-Fi Protected Setup (WPS) pushbutton session with my Win 7 client that resulted in a WPA2/AES secured connection to the 2.4 GHz radio. All tests were run with this secured connection using our new four-location wireless test process. First, let's look at the Benchmark Summary in Figure 6. The main takeaway here is that there isn't a significant difference in two and three stream throughput when averaged across the four locations tested. 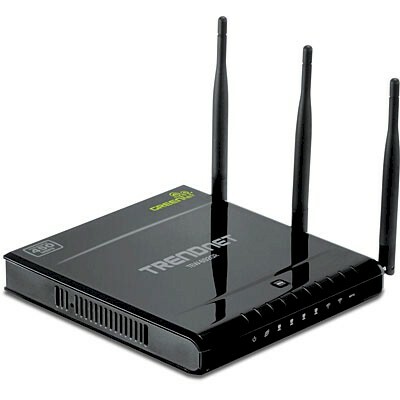 Although N routers that support three-streams in 2.4 GHz are harder to come by than those that provide this higher rate in the 5 GHz band, we've now got a few in the Charts database to compare: the TRENDnet TEW-691GR; D-Link DIR-665; and Gen 5 Apple Airport Extreme. Figure 7 shows the wireless Performance Table for the four routers for 2.4 GHz and 20 MHz mode and neither TRENDnet turns in a particularly noteworthy showing. The real standout here is the inability of both TRENDnets to get enough throughput in Location F to run the IxChariot test. The odd thing is that in some cases the Intel 5300 client still maintained connection to the 692GR. But there wasn't a good enough connection to even run a ping. I'm not going to show a 40 MHz mode table because the Apple doesn't support that mode and it doesn't really provide that much more insight into relative performance. I'll note that best case throughput for the 692GR was 70 Mbps in Location A running downlink in 40 MHz bandwidth mode. And when running simultaneous up and downlink tests in that mode, I measured 91 Mbps of total wireless throughput. Turning to the IxChariot plots reveals some interesting performance quirks. Figure 8 shows that even with strong signals, throughput is anything but nice and steady with periodic significant downward spikes. While it's possible that this is an artifact from IxChariot, I doubt it because I use the same test file size on other products and don't see this behavior. The other thing you'll see in this and most every other plot is the multi-second throughput ramp-up at the start of each run. This is definitely baked into the performance cake since I was unable to remove it with multiple test reruns. Figure 10 shows the IxChariot plots for 20 MHz mode downlink in three-stream mode. Throughput variation is still very high, but at least there is no ramp-up effect at the start of each run. Since there are more recent (and popular) options for 5 GHz three streamers, I kept the 5th Gen Airport Extreme, but subbed in the Cisco Linksys E4200 and NETGEAR WNDR4000 for the DIR-665 and TEW-691GR. Figure 11 shows the wireless Performance Table for the four routers for 5 GHz and 40 MHz mode, using the Intel 5300 two-stream client. I chose to show 40 MHz bandwidth mode for the 5 GHz comparison, since many of you will want to run that way for maximum throughput. As is typically seen, none of the products reach to the weak signal test location F. The 692GR looks like the weakest performer, eking out only 70 Mbps of best case throughput. Running simultaneous up and downlink tests bumped that up to only 85 Mbps of total throughput. Figure 12 shows the IxChariot plots for 5 GHz, 40 MHz mode downlink. That wonky oscillating throughput we saw earlier in the 2.4 GHz tests is back and looks worse, with higher variation. Note also the ramp-up affect at the beginning of some test runs. Here are links to the other 5 GHz, 2 stream plots for your reference.